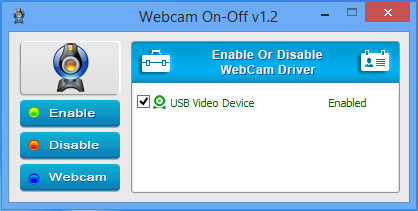 WebCam On-Off is a portable freeware that you can use it to easily disable or enable your WebCam device. Webcams may let you stay in touch with friends and family also a webcam allows you to record and stream video from your computer or laptop to the Internet or a video file. When you are not using your webcam, you may wish to disable it to ensure it is not recording by accident and they also pose risks of people hacking into them and spying on you surely ,Malware can take over webcams, so there is potential for your camera to spy on you , Most hackers utilize so-called Trojan horse attacks , they can take control of your webcam and make videos and take pictures of you without your knowledge.